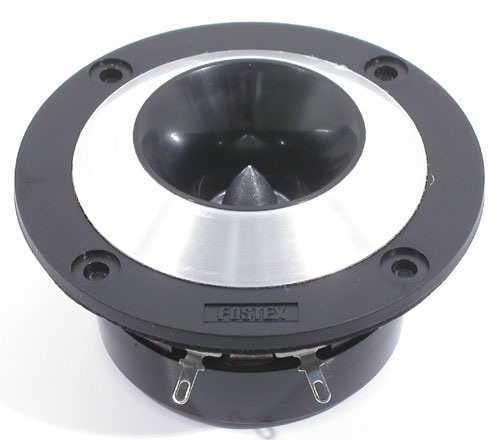 Fostex FE167E - Fostex has plenty of single full range raw speaker drivers in its’ product line. I’ve been a fan of Fostex since 2002 where I first built a 25 liter bass reflex book shelf speaker using Fostex FE167E running full range, being augmented or complemented by Fostex FT17H handling the high frequency. This 25 liter bookshelf captured the heart of many that listened to it. I built a floor-standing version as a result of that to push the limit of this driver. That sparked the interest of more people and where a few more pairs were built and loved by the single full range speaker driver enthusiasts. It is such a pity that FE167E has been discontinued and this page is to pay a tribute to this lovely speaker driver. Since it is shielded, it is a perfect choice for center channel in your home theater system! For those that purchased them for keeping sake or spares, congratulations! The Fostex FE167E is a true high efficiency full range driver. 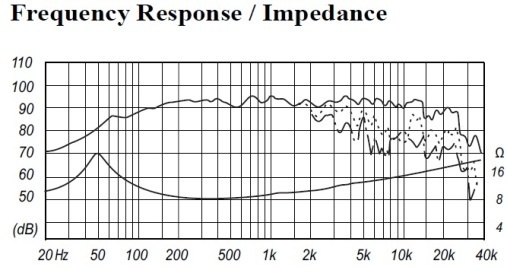 If you analyze the frequency response / impedance graph supplied by Foxtex (below), you can see that the SPL is around 92-94 dB/w/m flat with the impedance being > 8 Ohm ALL the time. 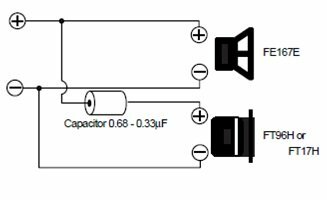 This presents a very easy load for tube amplifiers that matches very, very well with this speaker. The frequency stays quite flat from 100Hz to 20kHz indicating that the sound would be balanced instead of being overly bright. 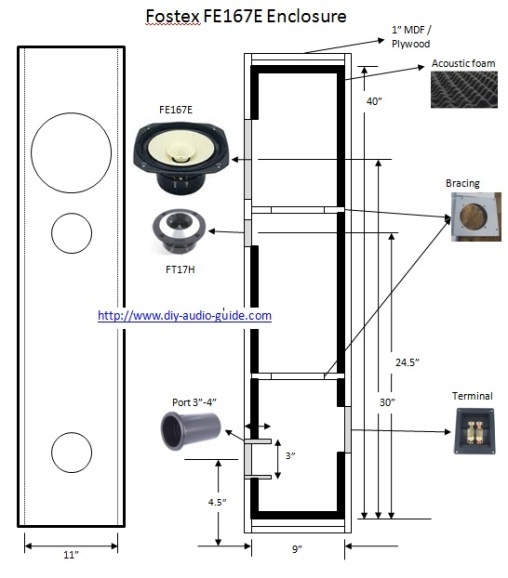 With Qts of 0.31, it is suitable to be housed in a bass reflex cabinet instead of requiring for horn loading that would be difficult + costly to build and tweak. Fostex recommended FT96H or FT17H to the speaker to fill in the weaker high frequency and I did so. From listening, 0.22uF – 0.47uF yielded the most balanced sound. If you further tweaked it by removing the dust cap (will be discussed later), 0.47uF is the best match. The high frequency of the FE167E sounds a bit harsh and fizzy. 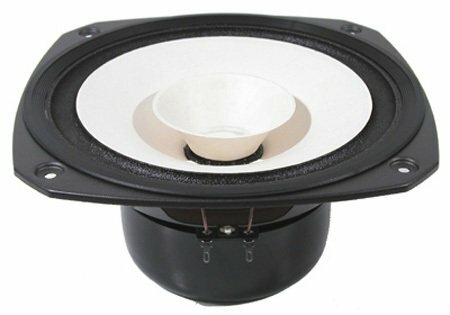 There are some tweaks that will improve the FE167E highs and the overall sound. Click here to get the high resolution speaker plans. 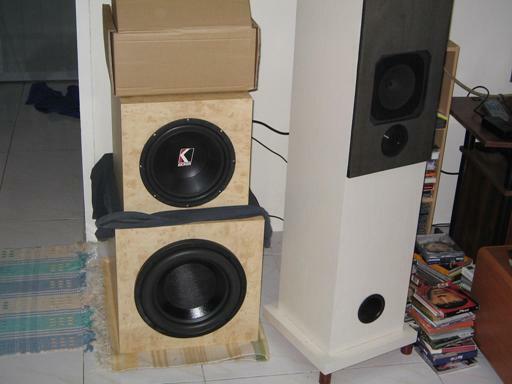 Picture is taken with the FE167E speaker standing beside a pair of subwoofers. Do not judge the sound when it is still fresh. Blast it for 200 hours before doing the evaluations. The initial sound will be brighter and harsher with recessed bass. With all the tweaks thrown in, and coupled with high quality amplification & source, it sounded very, VERY good. 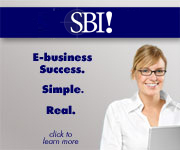 The sound is transparent, realistic, direct, immediate, and coherent. Sound-staging is 3D. Vocals are focused, full bodied and warm. Bass is not boomy and bloated. One can really reach out and touch the individual instruments and performers. The lacking place would be at the low bass region where it is slightly lightweight. Tube amplifier or low power class-D or class-T amplifier are highly recommended. Go to Class T Amplifier. 1W (6C45 SPUD) is nice, 3W (2A3) is better, 8W (300B) is perfect! Fast sounding subwoofer would complement the whole picture.